Check out our Go Mini's in action! Compare to Pods® in Tallahassee, Mike's Go Mini's are the easiest way to move and store your home or office. Mike's Go Minis® offers the best portable storage and moving containers in Tallahassee, FL. 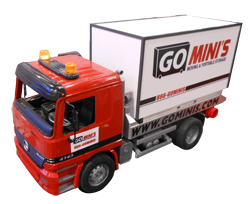 Go Minis® portable containers have superior design, moving container in Tallahassee with a 20 foot container. Whether you need portable storage, or a simple and convenient way to move across town or across the state, Go Minis® is the perfect alternative to PODS®, and other traditional moving and portable storage units. Whether you need portable storage, or a simple and convenient way to move across town or across the state, Go Mini's® is the perfect alternative to PODS®. Compare our prices to Door to Door®, Pack-Rat® and Pods Loading® as well as other traditional moving and storage options.  Translucent roof to let in plenty of natural light.  Vented to reduce moisture and humidity that may contribute to mold.  Locking metal roll-up door feels secure; you provide the lock.  Sturdy side railing for hanging clothing and securing load.  Steel constructed sturdy frame with galvanized steel siding. Full service residential and commercial moving and relocation company.